Sea Pirates Day - There was a rush of activity in the Foundation Phase class on Tuesday May 20th, with everybody having made a special effort to dress up as sea pirates as part of the theme “The Sea”. They had been busy preparing biscuits and boat shaped hot dogs. Cricket Competition – Some Yr 3 to 6 pupils represented the school in the cricket competition held at the Arfon Centre on Thursday June 19th. Padarn Lake Railway Energy Festival. – As part of the work on electricity, Yr3 to 6 have been studying, some of them attended the Energy Festival held on Thursday June 19th. Singing Festival held at St Helen’s Church –A Singing Festival was held at the Church to open Carnival Week activities on Sunday Evening 29/6/14 at 6:30 p.m. Some of the pupils presented an item during the evening. Moving Classes - Thursday July 3rd will be a very busy day at the School when everybody will have an opportunity to move up to the class that they will attend in September. We will also be inviting those children who will be attending the School for the first time in the nursery class here for the morning. Hopefully everybody will hugely enjoy these experiences. Visit to the Secondary School – Yr 6 will have an opportunity to go on their second visit to Ysgol Brynrefail on Thursday July 3rd. Best wishes to Elin, Brett, Ioan, Cai, William and Llion when they will be starting their education there in September. End of Summer Term trips - On Friday July 4th, Classes 3, 4, 5 and 6 will visit Canolfan Conwy at Llanfairpwll where they will participate in various activities. Reception and Y1 and 2 Classes will visit Anglesey Sea Zoo on Wednesday July 9th. They will have an opportunity under supervision to participate in a “safari” on the beach. Sports – Hopefully, the sports will be held on Thursday July 10th at 1.30 p.m. weather permitting. A warm welcome to everybody to come and support the children. Summer Holidays – The School will close on Friday July 18th and re-open for the children on Tuesday September 2nd. Gwynant Parri visited the School on March 11th to take photographs of the classes. Gwawr Williams visited the school on March 12th to give a presentation on fire safety in the home to Y3 to 6. Mr Andrew Setatree was welcomed to the School on Tuesday morning April 1st to hold the morning Service. PC Meirion Williams spent Wednesday morning April 2nd talking with the classes in turn about the dangers of drug and alcohol use. A delicious Dinner with a Greek flavour was enjoyed that had been prepared by Anti Carolyn and Anti Mandy on Friday April 11th. The tables and the Hall were decorated with national banners of Greece. Everybody has been very busy in the classes making cards and decorations to celebrate Easter. Congratulations to Abbi and Georgia Parkinson who were key members of the cross-country running team of Menai Track and Field club who recently won the Under 11 North Wales Cross-Country League. Dyfrig Evans and Catrin Mara were welcomed to the school on Tuesday morning February 18th. Everybody enjoyed listening to them presenting stories from various books in a highly entertaining manner. Some pupils from Y 3 to 6 participated at a Swimming Gala held at Caernarfon Leisure Centre on Thursday March 13th. Congratulations to everybody for participating, the School came 4th out of 12 at the end – very well done! The pupils had an opportunity to come to school wearing a dress associated with Wales on March 1st. In the afternoon, the Community Hall committee held a Welsh Tea afternoon with the pupils and committee members providing the entertainment. Many different people from the Community had attended and hugely enjoyed themselves. We hope to hold a similar afternoon next year. The school supported this worthy appeal again this year, selling Daffodils on a pin. £20 was raised. Thanks to everybody for their support. The Eisteddfod was held at Ysgol Brynrefail On Saturday March 8th. Thanks to everybody for doing their best, and congratulations to the Unison Group who came 1st, and to Elin Thomas who came 3rd in the piano solo. As part of the “Homes” theme, Reception Class, Year 1 and 2 pupils visited Llanberis Slate Museum on Thursday March 13th. They had an opportunity to see a worker splitting and chiselling slates, watch a film and visit the “Fron Haul’ row of houses. After lunch, everybody walked to the village of Llanberis to look at the various buildings there. Everybody had a delicious ice-cream to finish an enjoyable day. Thanks to everybody who bring clothing etc to the re-cycling bin at the school. This provides the school with a financial contribution every time the bill is full. Keep at it! Thanks to everybody who recently collected “Daily Post” Wish tokens. 15,563 were collected and the school received a cheque for £184.48. We are very grateful for everybody’s support. 7 new admissions were welcomed to the nursery class, Megan, Simone, Nel, Lois, Math, Macs and Efan have settled down very well. We welcome Miss Megan Jones as an Assistant in class 5 and 6, Mrs Sharon Jones as Foundation Phase Assistant, and Mrs Sam Williams who will be spending two days a week at KS2 as part of her College course. The School welcomes our new Cleaner in Charge, Mr Huw Trefor Williams who has settled down in his new post straight away. That is what we wish those pupils who have started at Ysgol Brynrefail. 33 pupils in classes 2, 3, 4, 5, and 6 have begun a series of weekly held swimming lessons on Thursday morning, which everybody enjoys. 16 pupils receive weekly lessons at the school. A coffee morning will be held at the School hall on Friday morning September 27th with the money raised going towards the above-mentioned appeal. Any member of the Community is welcome to visit between 10.30 and 11.30 for a cup of coffee and biscuits and a chat. The pupils have been very busy reducing our energy use over the past year as part of the scheme and a 9.8% reduction has occurred in our energy use compared to the previous year. Well done! Several pupils have joined for 2013 -14. Urdd activities will commence after Christmas. Mr Gwynant Parri will visit the School on Tuesday morning November 12th to take photos of the pupils. Anybody who does not have children attending the school is welcome to visit if they so wish. Estyn Inspectors visited the school in June and the school received a glowing report. Congratulations to everybody associated with the school. Fire Safety – On Wednesday afternoon 15TH May Gwawr from the Fire Service visited the school to give a talk on the importance of fire safety. Orienteering Festival – The children from Yr’s 3 to 6 had the opportunity to take part in the Orienteering Festival held at Padarn Country Park on Friday 24th May. Everyone enjoyed the experience. Cross-Country Race – On Thursday Evening April 18th, several children from Y3 to 6 had an opportunity to participate in a Cross-Country race competition organized for Gwynedd schools and held at the Faenol. Georgia Parkinson, Abbi Parkinson and Efa Baines finished in the top ten. Congratulations ! Everybody else who participated also deserve praise namely, Twm Herd, Aron Roberts, Ioan Williams, Enlli Williams and Mabli Baines. WCW and Magic of the Garden Show – The Infants class spent an enjoyable morning at Felinheli Memorial Hall on Thursday morning April 25th. They were fortunate enough to see this enjoyable and colourful show and had a pleasant time amongst children from various schools. Morning Service – Mr Andrew Setatree was welcomed to the School on Tuesday morning April30th to hold the service. The Urdd – The Net-ball team participated in a competition organized by the Urdd at Canolfan Arfon on Tuesday evening January 8th. Thanks to the children for their effort and for the parents support. Tennis Lessons – The lessons are held every Thursday morning at the Tennis Centre at Caernarfon. Stories Workshop – A very interesting morning was held in the company of the author Mari Gwilym on Monday morning January 21st. Morning Service – Mr Andrew Settatree visited the school on Tuesday morning February 5th and March 12th to hold the service. Swimming Gala – Some Y3 to 6 pupils participated at a Swimming Gala held at the Leisure Centre at Caernarfon on Thursday February 7th. Congratulations to everybody for participating. Eisteddfod Cylch yr Urdd – The Eisteddfod was held at Ysgol Brynrefail on Saturday February 23rd. Thanks to everybody for doing their best, and congratulations to the Unison Group who came 1st, and Elin Thomas who came 2nd on the piano solo. Our best wishes to them at the County Eisteddfod to be held at Pritchard Jones Hall, Bangor on Saturday March 16th. St David’s Day – As part of the celebrations, some of the pupils visited Penisarwaen Nursing Home on Thursday February 28 to present various items to entertain the residents. Everybody enjoyed participating. The children went to school dressed up in clothing associated with Wales on March 1st. In the afternoon, a Welsh Tea was held by the Community Hall committee with the pupils preparing the entertainment. Many members of the Community were present and enjoyed themselves hugely. We hope to hold a similar afternoon next year. Marie Curie Appeal – As usual, the school supported this worthy appeal this year, selling Daffodils on a pin. £28.30p was raised. Thanks to everybody for their support. Formula 1 - Y.5/6 enjoyed a special day at Venue Cymru, Llandudno on March 4th. They designed a Formula 1 racing car, using special software abd then exciting races were held against schools throughout North Wales. To end the day, a science exhibition was also held to entertain us. Service – A service was held for Y 5 and 6 by Rhian Jones from “Childline“ on Wednesday morning March 6th and on Friday March 15th. Visit – The Rector of St Helen’s Church, Rev Lloyd Jones visited Y3 and 4 on Tuesday afternoon 5/3/13. He gave a very interesting talk. Celebrating World Book Day – The Infants class had an opportunity to bring their favourite book to school and dressed up as one of the characters in the book. Everybody enjoyed the day and looked at the various books. Athletics Festival - Pupils from KS2 participated at an Athletics Festival organized for Arfon Area schools on Wednesday March 13th. Everybody enjoyed competing against children from the various other schools. Training Day – A staff training day will be held on Monday April 8th. The school re-opens for the pupils on Tuesday April 9th. Rydym yn gwybod bod nifer ohonoch a'ch ffrindiau yn siopa ar lein, felly mae Ysgol Gymuned Penisarwaun yn cydweithio gyda chwmni TheGivingMachine i gynhyrchu rhoddion ariannol ar ein cyfer bob tro rydych yn siopa arlein - heb gostio ceiniog yn ychwanegol. Ewch i www.thegivingmachine.co.uk er mwyn ymweld a'r siop arlein. Bydd popeth y byddwch yn ei brynu drwy'r wefan hon yn cynhyrchu rhodd ariannol i'r ysgol - a bydd cyfanswm y rhoddion ar gyfer yr ysgol yn cynyddu'n gyflyn iawn. Gallai 500 o siopwyr arlein, sy'n 'rhoi am ddim' i ysgol Gymuned Penisarwaen drwy TheGivingMachine godi tua £7,500 y flwyddyn.Mae mwy na 100 o siopau gwahanol yn rhan o The Giving Machine gan gynnwys eich holl ffefrynnau. 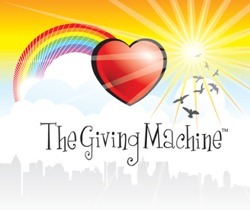 Do tell your family and friends about The GivingMachine and encourage them to register and shop on our behalf.